All ordered items can be returned. Time depends on product type. 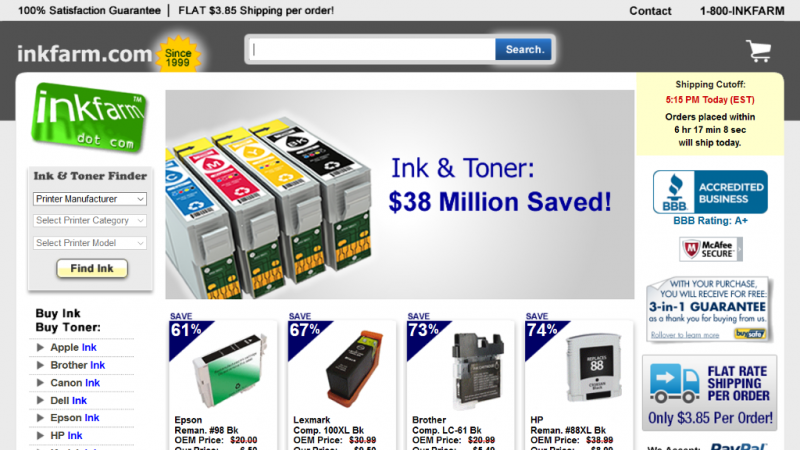 InkFarm.com sells brand name, new, refurbished and generic printer ink cartridges and toner cartridges for a wide variety of printers. In fact they sell cartridges for over 2000 printer models from all of the popular companies like Apple, Dell, Brother, Cannon, and Epson (about 15 listed in all). InkFarm.com has been in business since 1999 and is located in Seattle, WA, and ships from over 13 warehouses across the United States to ensure fast delivery times to any U.S. State and Canadian province. They are Better Business Bureau (BBB) accredited with an A+ rating. With InkFarm You can save up to 75% on many ink and toner cartridges when compared to brick and mortar office supply stores. 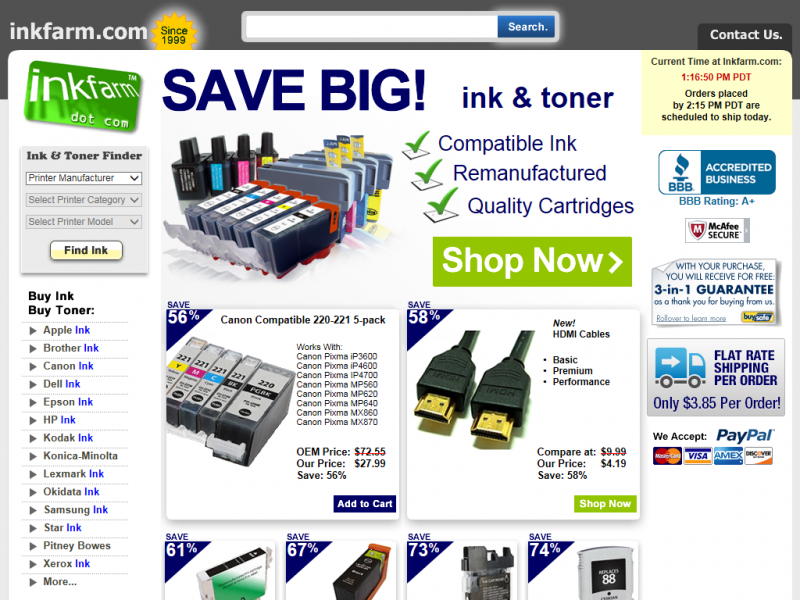 It is easy to find the ink and/or toner cartridges you are looking for. 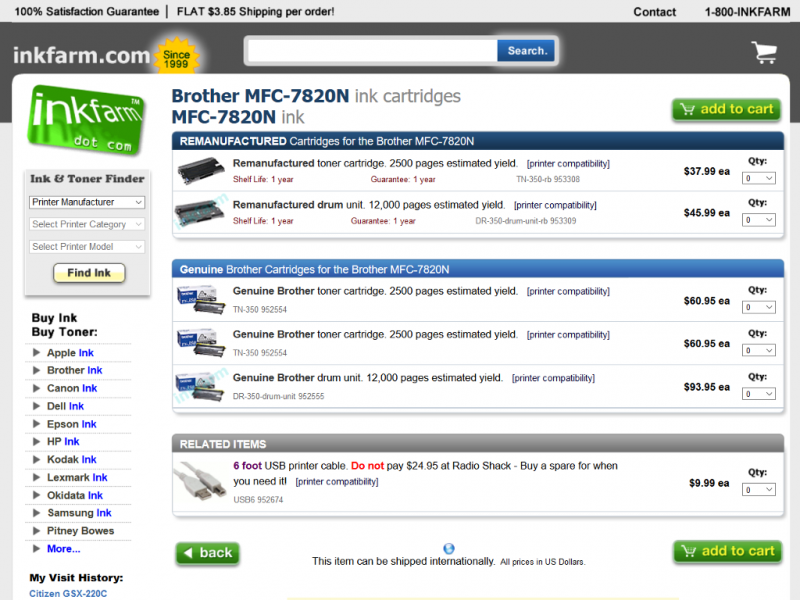 From the widget box on the left column of the site, select your printer manufacturer, followed by the printer category, and then printer model. The widget auto populates based on your previous selection which allows you to quickly find your printer cartridges. Once your selection is made you are then shown your printers cartridges page which shows all of the available cartridges for purchase broken down into Remanufactured and Genuine Cartridges. For each list item an image is shown along with a description and model number, page count, guarantee (if any), shelf life (if known), and of course a price. Any related items which InkFarm sells are also displayed which include a number of compatible printer accessories (like cables). One very handy feature of this page is it also includes a link to your printers manufacturer support page which contains documentation and printer drivers. There is a 2 year guarantee (from purchase) on all defective remanufactured and compatible inkjet and toner cartridges. You may exchange the defective item for the same or a different item of the same cost. The original packaging is not required but the labels on the cartridges cannot have been removed. Unopened remanufactured and compatible inkjet and toner cartridges may be returned within 60 days of shipping for a full refund. Unopened OEM merchandise (brand named) may be returned within 30 days of shipping for a refund. A restocking fee of up to $5.00 or 25% of the original purchase price (whichever is greater) may apply to certain OEM returns. For any returns or exchanges, shipping charges are not refundable. InkFarm.com ships only to the U.S. and Canada. They have a flat shipping rate of $3.85 per order (for any order size and to both countries). Customers receive 97% of their InkFarm orders in 2-5 days but a few items may take up to 8 days. InkFarm also offers Priority Overnight, Standard Overnight and 2nd day shipping for an additional cost. InkFarm ships via US Mail, UPS, and DHL. If you have selected overnight or second day shipping, they will use Fedex Overnight, or UPS Next Day, or 2nd Day service. All international orders are shipped via the US postal service First Class International service. All prices are listed in U.S. Dollars and you can pay for your order by check, money order, PayPal, and all major credit cards. You are not required to register on InkFarm.com when you order but it is recommended as it allows you to store your order history and other personal information (like shipping destination) to make your future order checkouts quicker. InkFarm is a great company to deal with. We have had no problems with any of the toner cartridges we have purchased for our Brother MFC Laser Printer. We purchased a genuine Brother toner cartridge for our first order a number of years ago. Since then we have ordered the remanufactured cartridges since they are a lot cheaper. The only issue we had once was when we didn't receive one of our toner orders on time. I had stupidly waited till the last minute to order when my printer finally ran out of toner (it had been complaining of low toner for weeks) . I usually choose the standard flat fee shipping since it is super cheap and usually arrives within 3 days. I choose overnight delivery this time and after a day I still hadn't received my order. I called up InkFarm's customer service (there support is available 7 days a week) and they quickly found out for me that the shipping company had messed things up and that my shipment should be arriving the next morning. While I didn't like waiting the extra 12 hours at that time (since I had something important to print) I was happy with their quick customer service response and their ability to find out right away what had happened. Lots of products and flat rate shipping to US and Canada.